The story of how discount curbside buses have transformed the nature of intercity travel. With a detour to rabbinical court. And a 15-minute rest stop. I can remember the first time I took one of the discount buses that now dominate bus travel between New York and Washington. It was the early aughts, and a line of people, mostly scraggly looking students like myself, had formed on the sidewalk near New York City’s Penn Station on 31st Street long before the scheduled departure. I was surprised when an energetic Orthodox man, his tzitzit showing beneath his shirt, payos peeking out beneath his cap, directed us toward the bus, checked our reservation and collected our money once we boarded. Back then, it was a cash affair. He hopped off before we entered the Lincoln Tunnel, and four or five hours later, with only books, magazines and the odd iPod to keep us company—it was the pre-smart phone days—we landed in Bethesda, Maryland, just outside of Washington, DC. I didn’t know it then, but I was witnessing the beginning of a paradigm shift in American transportation. The explosion of discount buses has revolutionized how Americans of all ages travel between cities. The post-World War II growth of personal automobile use and air travel had caused a steady decline in bus travel. Once a booming industry, American intercity buses carried 140 million riders in 1960, according to the U.S. Government Accountability Office. By 1990, it was only 40 million. But a plethora of new companies— some small, some large—has transformed the nature of American bus travel, even changing the way industry stalwarts such as Greyhound and Trailways do business. As a result, the number of scheduled discount intercity bus trips has increased 72 percent since 2010, and there are now more than 1,000 scheduled trips a day, according to a DePaul University study. Discount bus operators are adding routes four times faster than airlines and nearly seven times quicker than passenger rail. Indeed, buses are now the country’s fastest-growing mode of transportation. In the vanguard of the “revolution” have been two—warring—Hasidic-owned New York companies. Then, in 1996, Pei Lin Liang, who emigrated from China in 1988, began running a shuttle called Fung Wah Transportation Company for those who lived in Brooklyn’s Sunset Park neighborhood and worked in Manhattan’s Chinatown. Two years later, Fung Wah started a van service between the Chinatown districts of New York and Boston, so that Chinese immigrants could visit their children in college. The price was $10 each way, far cheaper than a ticket on Greyhound or Trailways. The low fares and frequent service proved popular. Fung Wah expanded, and other Chinese companies, including Sunshine Travel, Travel Pack and Lucky Star, followed suit, offering express point-to-point service to Chinatowns in different cities, including Washington. The buses soon gained a following among non-Asian cost-conscious travelers such as students, but they were no-frill affairs, and it was sometimes hard to learn the schedule or pinpoint where they departed and arrived. Passengers waiting to board TripperBus in Bethesda, MD. Her niceness was tested in 2004, when one of her employees, Menachem “Sol” Wollner, another Hasidic Jew, left Washington Deluxe to launch his own bus line between New York and Washington. He teamed up with his childhood friend Zanvel “Sam” Bluzenstein, who had driven and managed school buses in Williamsburg for 20 years. They called their new company Vamoose and went into business in direct competition with Washington Deluxe. Vamoose removed its routes from inside Washington but found a very willing clientele in Bethesda, the affluent Maryland suburb just past the city’s border, and later in Northern Virginia. Both companies have flourished, although the bus war continued. In 2008, Ungar launched TripperBus, with an embarkation point just a few blocks away from Vamoose’s Bethesda outpost. For Bolt and Megabus, this involved offering $1 fares to attract new riders. A price war ensued, putting a strain on some existing companies. Greyhound also completed a $60 million overhaul of its core operations in 2009—refurbishing 970 buses and upgrading 125 stations with plasma screen televisions and renovated bathrooms—but the company still had limited appeal. “Greyhound emblazoned on a bus will make the older generation think twice before buying a ticket, even if they would take the same exact service on a different bus,” says Schwieterman. It’s a copycat industry, with companies always looking for new ways to distinguish themselves. The current rage is luxury service that aims to expand buses to the Acela set. Vamoose has a special Gold Bus, with larger seats and fewer passengers, for $60 one-way. And in April, restaurateur Andy Seligman launched Royal Sprinter, a luxury van service between New York and Washington. At $90 a ticket, it is directed toward “someone who is willing to pay a little bit more for a lot more,” a company spokeswoman told me. This “more” includes individualized workstations and flatscreen TVs, as well as a refrigerator filled with complimentary sparkling water and snacks. 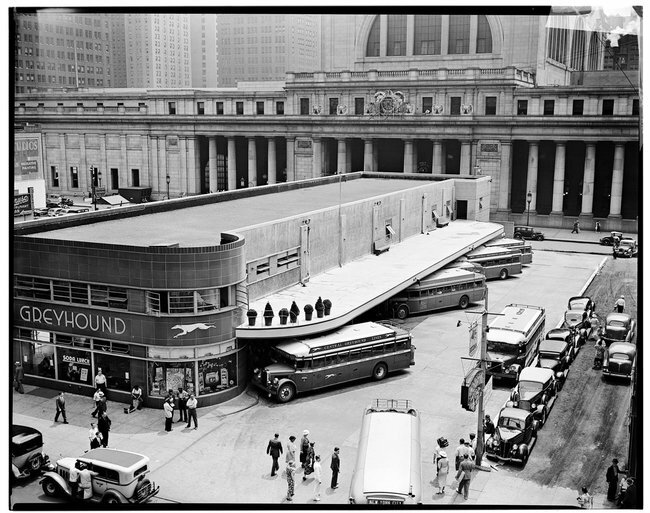 Greyhound Bus Terminal at Penn Station in 1936. Intercity bus travel became popular in the United States in the late 1920s. As opposed to other common modes of public transportation such as trains or streetcars, buses didn’t run on special tracks, could change their timetable and pickup points and required limited capital to launch. By 1935, a company named Greyhound purchased and merged existing routes, becoming America’s largest bus network. In 1936, a group of independent carriers formed Trailways to coordinate schedules and consolidate terminals in an attempt to challenge Greyhound’s monopoly. The two companies grew to dominate national bus service, although regional bus companies such as Peter Pan in New York and Badger Bus in Wisconsin carved out small service areas. The biggest victim of the industry’s success may be the original Chinatown buses. “The Asian [-owned] bus companies have really taken a blow, and it’s diminished their relevance,” says Schwieterman. Following the crash of a Chinatown bus that killed 15 people in 2011, the Federal Motor Carrier Safety Administration launched an investigation into curbside carriers, and on May 2012, the Administration shut down 26 bus companies—most of them Chinatown-based—in a single day. Since then 15 more have been forced to close. In the market free-for-all, there have been feuds and mergers as well as closures. Growth has slowed slightly in the past two years, but new routes continue to multiply. Last year, Megabus added service in Texas and California, and BoltBus added a Pacific Northwest operation. Buses still account for only 3.6 percent of intercity travel in the United States, but there are plenty of small bus lines in other parts of the country: Limoliner from Boston to New York, Jefferson Lines in the Midwest, Badger Bus in Wisconsin and California Shuttle between Los Angeles, San Francisco and the greater Bay Area. The smaller northeast companies are expanding into niche markets. This May, DC2NY will rebrand itself as Best Bus and add more routes, including shore towns. Meanwhile Washington Deluxe and Vamoose are busy ferrying passengers—young and old, secular and of all faiths, but not usually Hasidim, who prefer the dedicated Hasidic bus lines that target the ultra-Orthodox community. These include the Heimann Bus from New York City to Montreal and buses to Kiryas Joel, New York, and Baltimore, Maryland, from New York City as well as intra-Brooklyn and Manhattan buses. These buses adhere to rules and customs not generally found on curbside carriers, from a mechitza down the middle separating men and women, to prohibiting chametz on Passover. Actually, of all currently-available enclosed motorized forms of passenger transportation, The intercity motorcoach (bus) is the most fuel-efficient. See http://www.aertc.org/conference/AEC_Sessions%5CCopy%20of%20Session%201%5CTrack%20E-%20Innovation%5CIntelligent%20Advanced%20Transport%5C3.%20Dr.%20James%20Powell%5CJames%20Powell%20presentation.pdf and go to page 10. In the future, MagLev (Magnetic Levitation) will be even more fuel-efficient, but it is not yet available here. There is something wrong with those figures. I would guess they assume that the intercity bus is entirely full while the intercity train is mostly empty. Steel train wheels have much lower rolling resistance than tires, and a long train has less air resistance than an equivalent number of buses, and electric power is more efficient than gasoline, so on purely technical grounds a train should be more efficient than a bus. The article points out that the minute government gets out of the way, an industry does better and expands. Just like when Reagan revoked the “Fairness Doctrine” (which was anything but), radio (and especially talk radio) had renaissance. It was the government which shut down the unsafe Chinatown companies that killed one busload of passengers and put thousands of others at risk.